Canada is unusual among developed countries in the importance of the primary sector, with the logging and oil industries being two of Canada's most important. Canada also has a sizable manufacturing sector, based in Central Canada, with the automobile industry and aircraft industry being especially important. With the world's longest coastline, Canada has the 8th largest commercial fishing and seafood industry in the world. Canada is one of the global leaders of the entertainment software industry. It is a member of the APEC, NAFTA, G7, G20, OECD and WTO. 7.1 Relations with the U.S.
With the exception of a few island nations in the Caribbean, Canada is the only major Parliamentary system in the Western Hemisphere. As a result, Canada has developed its own social and political institutions, distinct from most other countries in the world. Though the Canadian economy is closely integrated with the American economy, it has developed unique economic institutions. The Canadian economic system generally combines elements of private enterprise and public enterprise. Many aspects of public enterprise, most notably the development of an extensive social welfare system to redress social and economic inequities, were adopted after the end of World War II in 1945. Canada has a private to public (Crown) property ratio of 60:40 and one of the highest levels of economic freedom in the world. Today Canada closely resembles the U.S. in its market-oriented economic system and pattern of production. As of 2017, Canada has 58 companies in the Forbes Global 2000 list, ranking seventh behind France and ahead of India. International trade makes up a large part of the Canadian economy, particularly of its natural resources. In 2009, agriculture, energy, forestry and mining exports accounted for about 58% of Canada's total exports. Machinery, equipment, automotive products and other manufactures accounted for a further 38% of exports in 2009. In 2009, exports accounted for about 30% of Canada's GDP. The United States is by far its largest trading partner, accounting for about 73% of exports and 63% of imports as of 2009. Canada's combined exports and imports ranked 8th among all nations in 2006. About 4% of Canadians are directly employed in primary resource fields, and they account for 6.2% of GDP. They are still paramount in many parts of the country. Many, if not most, towns in northern Canada, where agriculture is difficult, exist because of a nearby mine or source of timber. Canada is a world leader in the production of many natural resources such as gold, nickel, uranium, diamonds, lead, and in recent years, crude petroleum, which, with the world's second-largest oil reserves, is taking an increasingly prominent position in natural resources extraction. Several of Canada's largest companies are based in natural resource industries, such as Encana, Cameco, Goldcorp, and Barrick Gold. The vast majority of these products are exported, mainly to the United States. There are also many secondary and service industries that are directly linked to primary ones. For instance one of Canada's largest manufacturing industries is the pulp and paper sector, which is directly linked to the logging business. The reliance on natural resources has several effects on the Canadian economy and Canadian society. While manufacturing and service industries are easy to standardize, natural resources vary greatly by region. This ensures that differing economic structures developed in each region of Canada, contributing to Canada's strong regionalism. At the same time the vast majority of these resources are exported, integrating Canada closely into the international economy. Howlett and Ramesh argue that the inherent instability of such industries also contributes to greater government intervention in the economy, to reduce the social impact of market changes. Natural resource industries also raise important questions of sustainability. Despite many decades as a leading producer, there is little risk of depletion. Large discoveries continue to be made, such as the massive nickel find at Voisey's Bay. Moreover, the far north remains largely undeveloped as producers await higher prices or new technologies as many operations in this region are not yet cost effective. In recent decades Canadians have become less willing to accept the environmental destruction associated with exploiting natural resources. High wages and Aboriginal land claims have also curbed expansion. Instead many Canadian companies have focused their exploration, exploitation and expansion activities overseas where prices are lower and governments more amenable. Canadian companies are increasingly playing important roles in Latin America, Southeast Asia, and Africa. The depletion of renewable resources has raised concerns in recent years. After decades of escalating overutilization the cod fishery all but collapsed in the 1990s, and the Pacific salmon industry also suffered greatly. The logging industry, after many years of activism, has in recent years moved to a more sustainable model, or to other countries. Productivity measures are key indicators of economic performance and a key source of economic growth and competitiveness. The Organisation for Economic Co-operation and Development (OECD)'s[notes 1] Compendium of Productivity Indicators, published annually, presents a broad overview of productivity levels and growth in member nations, highlighting key measurement issues. It analyses the role of "productivity as the main driver of economic growth and convergence" and the "contributions of labour, capital and MFP in driving economic growth". According to the definition above "MFP is often interpreted as the contribution to economic growth made by factors such as technical and organisational innovation" (OECD 2008,11). Measures of productivity include Gross Domestic Product (GDP)(OECD 2008,11) and multifactor productivity. According to the OECD's annual economic survey of Canada in June 2012, Canada has experienced weak growth of multi-factor productivity (MFP) and has been declining further since 2002. One of the ways MFP growth is raised is by boosting innovation and Canada's innovation indicators such as business R&D and patenting rates were poor. Raising MFP growth is "needed to sustain rising living standards, especially as the population ages". The mandate of the central bank—the Bank of Canada is to conduct monetary policy that "preserves the value of money by keeping inflation low and stable". The Bank of Canada issues its bank rate announcement through its Monetary Policy Report which is released eight times a year. The Bank of Canada, a federal crown corporation, has the responsibility of Canada's monetary system. Under the inflation-targeting monetary policy that has been the cornerstone of Canada's monetary and fiscal policy since the early 1990s, the Bank of Canada sets an inflation target The inflation target was set at 2 per cent, which is the midpoint of an inflation range of 1 to 3 per cent. They established a set of inflation-reduction targets to keep inflation "low, stable and predictable" and to foster "confidence in the value of money", contribute to Canada's sustained growth, employment gains and improved standard of living. In a January 9, 2019 statement on the release of the Monetary Policy Report, Bank of Canada Governor Stephen S. Poloz summarized major events since the October report, such as "negative economic consequences" of the US-led trade war with China. In response to the ongoing trade war "bond yields have fallen, yield curves have flattened even more and stock markets have repriced significantly" in "global financial markets". In Canada, low oil prices will impact Canada's "macroeconomic outlook". Canada's housing sector is not stabilizing as quickly as anticipated. During the period that John Crow was Governor of the Bank of Canada—1987 to 1994— there was a worldwide recession and the bank rate rose to around 14% and unemployment topped 11%. Although since that time inflation-targeting has been adopted by "most advanced-world central banks", in 1991 it was innovative and Canada was an early adopter when the then-Finance Minister Michael Wilson approved the Bank of Canada's first inflation-targeting in the 1991 federal budget. The inflation target was set at 2 per cent. Inflation is measured by the total consumer price index (CPI). In 2011 the Government of Canada and the Bank of Canada extended Canada's inflation-control target to December 31, 2016. The Bank of Canada uses three unconventional instruments to achieve the inflation target: "a conditional statement on the future path of the policy rate", quantitative easing, and credit easing. As a result, interest rates and inflation eventually came down along with the value of the Canadian dollar. From 1991 to 2011 the inflation-targeting regime kept "price gains fairly reliable". Following the Financial crisis of 2007–08 the narrow focus of inflation-targeting as a means of providing stable growth in the Canadian economy was questioned. By 2011, the then-Bank of Canada Governor Mark Carney argued that the central bank's mandate would allow for a more flexible inflation-targeting in specific situations where he would consider taking longer "than the typical six to eight quarters to return inflation to 2 per cent". On July 15, 2015, the Bank of Canada announced that it was lowering its target for the overnight rate by another one-quarter percentage point, to 0.5 per cent "to try to stimulate an economy that appears to have failed to rebound meaningfully from the oil shock woes that dragged it into decline in the first quarter". According to the Bank of Canada announcement, in the first quarter of 2015, the total Consumer price index (CPI) inflation was about 1 per cent. This reflects "year-over-year price declines for consumer energy products". Core inflation in the first quarter of 2015 was about 2 per cent with an underlying trend in inflation at about 1.5 to 1.7 per cent. In response to the Bank of Canada's July 15, 2015 rate adjustment, Prime Minister Stephen Harper explained that the economy was "being dragged down by forces beyond Canadian borders such as global oil prices, the European debt crisis, and China's economic slowdown" which has made the global economy "fragile". The Chinese stock market had lost about US$3 trillion of wealth by July 2015 when panicked investors sold stocks, which created declines in the commodities markets, which in turn negatively impacted resource-producing countries like Canada. The Bank's main priority has been to keep inflation at a moderate level. As part of that strategy, interest rates were kept at a low level for almost seven years. Since September 2010, the key interest rate (overnight rate) was 0.5%. In mid 2017, inflation remained below the Bank's 2% target, (at 1.6%) mostly because of reductions in the cost of energy, food and automobiles; as well, the economy was in a continuing spurt with a predicted GDP growth of 2.8 percent by year end. Early on 12 July 2017, the bank issued a statement that the benchmark rate would be increased to 0.75%. "The economy can handle very well this move we have today and of course you need to preface that with an acknowledgment that of course interest rates are still very low", Governor Stephen Poloz subsequently said. In its press release, the bank had confirmed that the rate would continue to be evaluated at least partly on the basis of inflation. "Future adjustments to the target for the overnight rate will be guided by incoming data as they inform the bank's inflation outlook, keeping in mind continued uncertainty and financial system vulnerabilities." Poloz refused to speculate on the future of the economy but said, "I don't doubt that interest rates will move higher, but there's no predetermined path in mind at this stage". The service sector in Canada is vast and multifaceted, employing about three quarters of Canadians and accounting for 70% of GDP. The largest employer is the retail sector, employing almost 12% of Canadians. The retail industry is concentrated mainly in a small number of chain stores clustered together in shopping malls. In recent years, there has been an increase in the number of big-box stores, such as Wal-Mart (of the United States), Real Canadian Superstore, and Best Buy (of the United States). This has led to fewer workers in this sector and a migration of retail jobs to the suburbs. The second largest portion of the service sector is the business service and hire only a slightly smaller percentage of the population. This includes the financial services, real estate, and communications industries. This portion of the economy has been rapidly growing in recent years. It is largely concentrated in the major urban centres, especially Toronto, Montreal and Vancouver (see Banking in Canada). Canada has an important high tech industry, and a burgeoning film, television, and entertainment industry creating content for local and international consumption (see Media in Canada). Tourism is of ever increasing importance, with the vast majority of international visitors coming from the United States. Casino gaming is currently the fastest-growing component of the Canadian tourism industry, contributing $5 billion in profits for Canadian governments and employing 41,000 Canadians as of 2001. The general pattern of development for wealthy nations was a transition from a primary industry based economy to a manufacturing based one, and then to a service based economy. At its World War II peak in 1944, Canada's manufacturing sector accounted for 29% of GDP, declining to 10.37% in 2017. Canada has not suffered as greatly as most other rich, industrialized nations from the pains of the relative decline in the importance of manufacturing since the 1960s. A 2009 study by Statistics Canada also found that, while manufacturing declined as a relative percentage of GDP from 24.3% in the 1960s to 15.6% in 2005, manufacturing volumes between 1961 and 2005 kept pace with the overall growth in the volume index of GDP. Manufacturing in Canada was especially hit hard by the financial crisis of 2007–08. As of 2017, manufacturing accounts for 10% of Canada's GDP, a relative decline of more than 5% of GDP since 2005. Central Canada is home to branch plants to all the major American and Japanese automobile makers and many parts factories owned by Canadian firms such as Magna International and Linamar Corporation. Syncrude's Mildred Lake plant site at the Athabasca oil sands in Alberta. Canada is one of the few developed nations that is a net exporter of energy—in 2009 net exports of energy products amounted to 2.9% of GDP. Most important are the large oil and gas resources centred in Alberta and the Northern Territories, but also present in neighbouring British Columbia and Saskatchewan. The vast Athabasca oil sands give Canada the world's third largest reserves of oil after Saudi Arabia and Venezuela according to USGS. In British Columbia and Quebec, as well as Ontario, Saskatchewan, Manitoba and the Labrador region, hydroelectric power is an inexpensive and relatively environmentally friendly source of abundant energy. In part because of this, Canada is also one of the world's highest per capita consumers of energy. Cheap energy has enabled the creation of several important industries, such as the large aluminum industries in British Columbia and Quebec. Historically, an important issue in Canadian politics is the interplay between the oil and energy industry in Western Canada and the industrial heartland of Southern Ontario. Foreign investment in Western oil projects has fueled Canada's rising dollar. This has raised the price of Ontario's manufacturing exports and made them less competitive, a problem similar to the decline of the manufacturing sector in the Netherlands. Also, Ontario has relatively fewer native sources of power. However, it is cheaper for Alberta to ship its oil to the western United States than to eastern Canada. The eastern Canadian ports thus import significant quantities of oil from overseas, and Ontario makes significant use of nuclear power. The National Energy Policy of the early 1980s attempted to force Alberta to sell low-priced oil to eastern Canada. This policy proved deeply divisive, and quickly lost its importance as oil prices collapsed in the mid-1980s. One of the most controversial sections of the Canada–United States Free Trade Agreement of 1988 was a promise that Canada would never charge the United States more for energy than fellow Canadians. Canada is also one of the world's largest suppliers of agricultural products, particularly of wheat and other grains. Canada is a major exporter of agricultural products, to the United States and Asia. As with all other developed nations the proportion of the population and GDP devoted to agriculture fell dramatically over the 20th century. As with other developed nations, the Canadian agriculture industry receives significant government subsidies and supports. However, Canada has been a strong supporter of reducing market influencing subsidies through the World Trade Organization. In 2000, Canada spent approximately CDN$4.6 billion on supports for the industry. Of this, $2.32 billion was classified under the WTO designation of "green box" support, meaning it did not directly influence the market, such as money for research or disaster relief. All but $848.2 million were subsidies worth less than 5% of the value of the crops they were provided for. Canada and the United States share a common trading relationship. Canada's job market continues to perform well along with the US, reaching a 30-year low in the unemployment rate in December 2006, following 14 consecutive years of employment growth. 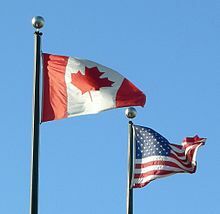 The United States is by far Canada's largest trading partner, with more than $1.7 billion CAD in trade per day in 2005. In 2009, 73% of Canada's exports went to the United States, and 63% of Canada's imports were from the United States. Trade with Canada makes up 23% of the United States' exports and 17% of its imports. By comparison, in 2005 this was more than U.S. trade with all countries in the European Union combined, and well over twice U.S. trade with all the countries of Latin America combined. Just the two-way trade that crosses the Ambassador Bridge between Michigan and Ontario equals all U.S. exports to Japan. Canada's importance to the United States is not just a border-state phenomenon: Canada is the leading export market for 35 of 50 U.S. states, and is the United States' largest foreign supplier of energy. Bilateral trade increased by 52% between 1989, when the U.S.–Canada Free Trade Agreement (FTA) went into effect, and 1994, when the North American Free Trade Agreement (NAFTA) superseded it. Trade has since increased by 40%. NAFTA continues the FTA's moves toward reducing trade barriers and establishing agreed-upon trade rules. It also resolves some long-standing bilateral irritants and liberalizes rules in several areas, including agriculture, services, energy, financial services, investment, and government procurement. NAFTA forms the largest trading area in the world, embracing the 405 million people of the three North American countries. The largest component of U.S.–Canada trade is in the commodity sector. The U.S. is Canada's largest agricultural export market, taking well over half of all Canadian food exports. Nearly two-thirds of Canada's forest products, including pulp and paper, are exported to the United States; 72% of Canada's total newsprint production also is exported to the U.S.
At $73.6 billion in 2004, U.S.-Canada trade in energy is the largest U.S. energy trading relationship, with the overwhelming majority ($66.7 billion) being exports from Canada. The primary components of U.S. energy trade with Canada are petroleum, natural gas, and electricity. Canada is the United States' largest oil supplier and the fifth-largest energy producing country in the world. Canada provides about 16% of U.S. oil imports and 14% of total U.S. consumption of natural gas. The United States and Canada's national electricity grids are linked, and both countries share hydropower facilities on the western borders. While most of U.S.-Canada trade flows smoothly, there are occasionally bilateral trade disputes, particularly in the agricultural and cultural fields. Usually these issues are resolved through bilateral consultative forums or referral to World Trade Organization (WTO) or NAFTA dispute resolution. In May 1999, the U.S. and Canadian governments negotiated an agreement on magazines that provides increased access for the U.S. publishing industry to the Canadian market. The United States and Canada also have resolved several major issues involving fisheries. By common agreement, the two countries submitted a Gulf of Maine boundary dispute to the International Court of Justice in 1981; both accepted the court's 12 October 1984 ruling which demarcated the territorial sea boundary. A current issue between the United States and Canada is the ongoing softwood lumber dispute, as the U.S. alleges that Canada unfairly subsidizes its forestry industry. In 1990, the United States and Canada signed a bilateral Fisheries Enforcement Agreement, which has served to deter illegal fishing activity and reduce the risk of injury during fisheries enforcement incidents. The U.S. and Canada signed a Pacific Salmon Agreement in June 1999 that settled differences over implementation of the 1985 Pacific Salmon Treaty for the next decade. Canada and the United States signed an aviation agreement during Bill Clinton's visit to Canada in February 1995, and air traffic between the two countries has increased dramatically as a result. The two countries also share in operation of the St. Lawrence Seaway, connecting the Great Lakes to the Atlantic Ocean. The U.S. is Canada's largest foreign investor and the most popular destination for Canadian foreign investments; at the end of 2007, the stock of U.S. direct investment in Canada was estimated at $293 billion, while Canadian direct investment (stock) in the United States was valued at $213 billion. U.S. FDI accounts for 59.5% of total foreign direct investment in Canada while Canadian FDI in the U.S. accounts for 10% (5th largest foreign investor). US investments are primarily directed at Canada's mining and smelting industries, petroleum, chemicals, the manufacture of machinery and transportation equipment, and finance, while Canadian investment in the United States is concentrated in manufacturing, wholesale trade, real estate, petroleum, finance, and insurance and other services. The OECD reports the Central Government Debt as percentage of the GDP. In 2000 Canada's was 40.9 percent, in 2007 it was 25.2 percent, in 2008 it was 28.6 percent and by 2010 it was 36.1 percent. The OECD reports net financial liabilities measure used by the OECD, reports the net number at 25.2%, as of 2008, making Canada's total government debt burden as the lowest in the G8. The gross number was 68% in 2011. The CIA World Factbook, updated weekly, measures financial liabilities by using gross general government debt, as opposed to net federal debt used by the OECD and the Canadian federal government. Gross general government debt includes both "intragovernmental debt and the debt of public entities at the sub-national level". For example, the CIA measured Canada's public debt as 84.1% of GDP in 2012 and 87.4% of GDP in 2011 making it 22nd in the world. Household debt, the amount of money that all adults in the household owe financial institutions, includes consumer debt and mortgage loans. In March 2015 the International Monetary Fund reported that Canada's high household debt was one of two vulnerable domestic areas in Canada's economy; the second is its overheated housing market. According to a July 2015 report by Laura Cooper, an economist with the RBC—the largest financial institution in Canada—"outstanding household credit balances" had reached $1.83 trillion. According to Philip Cross of the Fraser Institute, in May 2015, while the Canadian household debt-to-income ratio is similar to that in the US, however lending standards in Canada are tighter than those in the United States to protect against high-risk borrowers taking out unsustainable debt. Since 1985 63,755 deals in- and outbound Canada have been announced.[when?] This cummulates to an overall value of 3700.5 bil. USD. Almost 50% of the targets of Canadian companies (outbound deals) have a parent company in the US. Inbound deals are 82% percent from the US. ^ The OECD produces an annual report on member nations who share the goal of "contributing to the development of the world economy" by attaining the "highest sustainable economic growth and employment and a rising standard of living while maintaining financial stability." ^ a b c International Monetary Fund (October 2018). "Report for Selected Countries and Subjects: Canada". ^ International Monetary Fund (October 2018). "Report for Selected Countries and Subjects: Canada". ^ "Gross domestic product, income and expenditure, third quarter 2018". Government. StatsCanada. November 30, 2018. ^ "Consumer Price Index, October 2018". Statistics Canada. Retrieved December 18, 2018. ^ "Income Distribution and Poverty". OECD.Stat (database). Retrieved January 6, 2016. ^ "Labor force, total". World Bank. World Bank. Retrieved September 2, 2016. ^ "Labour Force Survey, November 2018". Statcan.gc.ca. Retrieved December 18, 2018. ^ "Payroll employment, earnings and hours, September 2018". Statistics Canada. ^ "Ease of Doing Business in Canada". Doingbusiness.org. Retrieved November 24, 2017. ^ a b c d "Canada - WTO Statistics Database". World Trade Organization. Retrieved March 1, 2017. ^ "Country Fact Sheets 2016". unctad.org. Retrieved July 5, 2017. ^ "Canada's balance of international payments, third quarter 2018". Statcan.gc.ca. Retrieved December 18, 2018. ^ "Statistics Canada". Retrieved July 9, 2017. ^ "Public debt of Canada". CIA World Factbook. 2017. Archived from the original on January 20, 2018. Retrieved December 29, 2018. ^ "Sovereigns rating list". Standard & Poor's. Retrieved January 14, 2012. ^ "Moody's Affirms Canada's Aaa Rating; Maintains Stable Outlook". Moody's Investors Service. November 2, 2016. Retrieved September 23, 2017. ^ "Fitch - Complete Sovereign Rating History". Retrieved February 25, 2013. ^ "Actual hours worked per week by industry, seasonally adjusted crack". Statistics Canada. Archived from the original on November 3, 2008. ^ James, Patrick (2008). Canadian Studies in the New Millennium. University of Toronto Press. p. 310. ISBN 9780802094681. ^ Damian Kahya & Richard Anderson (November 29, 2011). "Oil sands battle between Canada and EU". BBC News. ^ Robson Fletcher (May 30, 2016). "Canada's energy superpower status threatened as world shifts off fossil fuel, federal think-tank warns". CBC News. ^ Kazi Islam and Patrick Adams (June 29, 2010). "Natural resource wealth, 1990 to 2009". Statistics Canada. ^ "Aquaculture Canada: Facts and Figures". Dfo-mpo.gc.ca. February 2, 2011. Archived from the original on June 15, 2012. Retrieved February 1, 2013. ^ "Canada's Entertainment Software Industry In 2011 A Report Prepared For The Entertainment Software Association Of Canada" (PDF). Archived from the original (PDF) on May 7, 2013. Retrieved February 5, 2016. ^ Central Intelligence Agency (May 16, 2006). "The World Factbook: Canada". Central Intelligence Agency. Retrieved May 6, 2007. ^ "The World's Largest Public Companies 2017". Forbes. U.S. companies account for the most members of the list, 565, followed by China and Hong Kong, which is home to 263 Global 2000 companies. ^ a b "Exports of goods on a balance-of-payments basis, by product". Statistics Canada. Archived from the original on November 2, 2011. ^ "Imports, exports and trade balance of goods on a balance-of-payments basis, by country or country grouping". Statistics Canada. Archived from the original on June 18, 2006. ^ "Gross domestic product at basic prices, by industry (monthly)". Statistics Canada. Archived from the original on April 28, 2011. ^ "Report for Selected Countries and Subjects". Retrieved September 7, 2018. ^ OECD Economic Surveys Canada June 2012 Overview (PDF) (Report). Organization for Economic Co-operation and Development. 2012. Archived (PDF) from the original on August 13, 2013. ^ a b c d e f Monetary Policy Report (PDF) (Report). July 15, 2015. Retrieved August 6, 2015. ^ Poloz, Stephen S. (January 9, 2019). "Opening Statement" (Press release). Monetary Policy Report. Ottawa, Ontario: Bank of Canada. Retrieved January 9, 2019. ^ a b c Gross domestic product (GDP) at basic prices, by industry, annual average (x 1,000,000), Statistics Canada, Table 36-10-0434-03, 2018. ^ "CIA World Factbook - Canada". Cia.gov. Retrieved October 14, 2018. ^ Gasher, Mike (2002). Hollywood North the feature film industry in British Columbia. Vancouver: UBC Press. ISBN 978-0774809689. ^ MacLaurin, Tanya; MacLaurin, Donald (2003). "Casino gaming and tourism in Canada". International Journal of Contemporary Hospitality Management. MCB UP Ltd. 15 (6): 328–332. doi:10.1108/09596110310488177. ^ a b "Manufacturing's share of gross domestic product, 1900 to 2005". Statistics Canada. ^ "Canada vs. The OECD: An Environmental Comparison". Environmentalindicators.com. Retrieved February 22, 2011. ^ "Resource-based Industries and High-tech Manufacturing - Goods Sector - Major Industries - A Guide to the BC Economy and Labour Market". Guidetobceconomy.org. Archived from the original on September 7, 2011. Retrieved November 2, 2011. ^ Canadian, The (October 4, 2011). "Aluminum heavyweights to make $15-billion Quebec investment". Canadian Manufacturing. Archived from the original on October 13, 2011. Retrieved November 2, 2011. ^ Lee Greenberg (July 20, 2011). "Growing Equalization Payments to Ontario Threaten Country". National Post. ^ Michel Beine; Charles S. Bos; Serge Coulombe (January 2009). "Does the Canadian economy suffer from Dutch Disease?" (PDF). Archived from the original (PDF) on November 17, 2011. ^ "Ontario's Electricity System – Frequently Asked Questions". QUEEN'S PRINTER FOR ONTARIO. Retrieved January 22, 2018. ^ "The Relative Position of Canada in the World Grain Market". Dsp-psd.pwgsc.gc.ca. October 2, 2002. Retrieved February 22, 2011. ^ "Canada's Free Trade Agreements". International.gc.ca. Archived from the original on March 12, 2014. Retrieved December 18, 2013. ^ a b "Canada's Free Trade Agreements". International.gc.ca. Archived from the original on March 12, 2014. Retrieved March 11, 2014. ^ The Canadian Press (February 24, 2011). "Canada, Japan study free-trade pact". CBC News. Retrieved February 28, 2011. ^ "The Daily, Friday, January 5, 2007. Labour Force Survey". Statcan.ca. January 5, 2007. Archived from the original on May 28, 2008. Retrieved February 22, 2011. ^ "Imports, exports and trade balance of goods on a balance-of-payments basis, by country or country grouping". 0.statcan.gc.ca. February 11, 2011. Archived from the original on April 28, 2011. Retrieved February 22, 2011. ^ FTDWebMaster, [Name of person creating HTML]. "FTD - Statistics - Trade Highlights - Top Trading Partners". Census.gov. Retrieved February 22, 2011. ^ FTDWebMaster, FTD Data Dissemination. "FTD - Statistics - Country Data - U.S. Trade Balance with European Union". Census.gov. Retrieved February 22, 2011. ^ FTDWebMaster, FTD Data Dissemination. "FTD - Statistics - Country Data - U.S. Trade Balance with South and Central America". Census.gov. Retrieved February 22, 2011. ^ "The Pacific Salmon Treaty: The 1999 Agreement and Renegotiated Annex IV". EveryCRSReport.com. May 5, 2009. ^ "HowStuffWorks "The St. Lawrence Seaway"". Geography.howstuffworks.com. March 30, 2008. Retrieved February 22, 2011. ^ "Foreign Direct Investment in the United States: An Economic Analysis" (PDF). Retrieved February 22, 2011. ^ "The Canada-U.S. trade and investment partnership". Canadainternational.gc.ca. October 28, 2008. Archived from the original on July 22, 2012. Retrieved February 22, 2011. ^ "Overview of Canadian Foreign Direct Investment (PRB-0833E)". .parl.gc.ca. June 17, 2008. Archived from the original on May 2, 2010. Retrieved February 22, 2011. ^ a b Central Government Debt (Report). OECD. 2011. Retrieved June 13, 2013. ^ "Fiscal balances and public indebtedness | OECD Economic Outlook". Find Articles. October 27, 2011. Archived from the original on July 10, 2012. Retrieved November 2, 2011. ^ "CIA - The World Factbook". Cia.gov. Retrieved June 13, 2013. ^ Cooper, Laura (July 2015). July 2015 (PDF) (Report). Canadian Credit. RBC Economics. Retrieved August 7, 2015. ^ a b "M&A Canada - Mergers & Acquistions Statistics". IMAA-Institute. Retrieved February 22, 2018. Easterbrook, William Thomas; Aitken, Hugh G. J (1988). Canadian Economic History. University of Toronto Press. ISBN 0-8020-6696-8.